Researchers found that the thermal conductivity of superatom crystals is directly related to the rotational disorder within those structures. The findings were published in an article in Nature Materials this week. Carnegie Mellon University's Associate Professor of Mechanical Engineering Jonathan A. Malen was a corresponding author of the paper titled "Orientational order controls crystalline and amorphous thermal transport in superatomic crystals." Superatom crystals are periodic—or regular—arrangements of C60 fullerenes and similarly sized inorganic molecular clusters. The nanometer sized C60s look like soccer balls with C atoms at the vertices of each hexagon and pentagon. "There are two nearly identical formations, one that has rotating (i.e. orientationally disordered) C60s and one that has fixed C60s," said Malen. "We discovered that the formation that contained rotating C60s has low thermal conductivity while the formation with fixed C60s has high thermal conductivity." 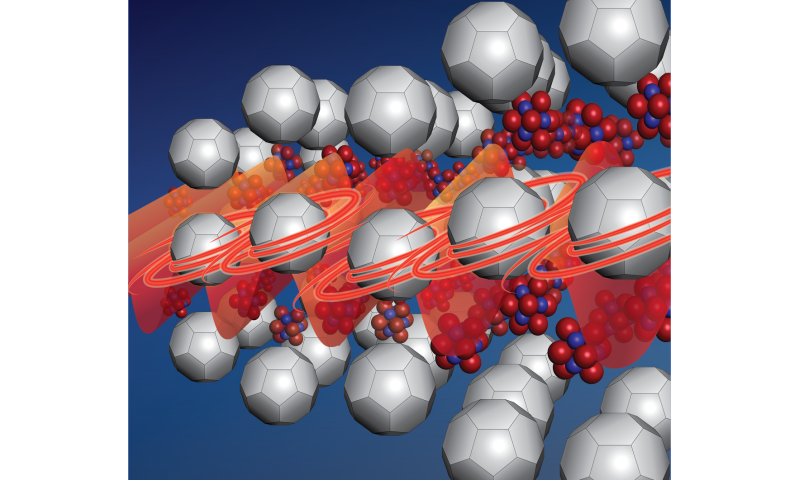 Although rotational disorder is known in bulk C60, this is the first time that the process has been leveraged to create very different thermal conductivities in structurally identical materials. Imagine a line of people passing sandbags from one end to the other. Now imagine a second line where each person is spinning around—some clockwise, some counter clockwise, some fast, and some slow. It would be very difficult to move a sandbag down that line. "This is similar to what is happening with thermal conductivity in the superatoms," explained Malen. "It is easier to transfer heat energy along a fixed pattern than a disordered one." Columbia University's Assistant Professor of Chemistry Xavier Roy, the other corresponding author of the study, created the superatom crystals in his laboratory by synthesizing and assembling the building blocks into the hierarchical superstructures. "Superatom crystals represent a new class of materials with potential for applications in sustainable energy generation, energy storage, and nanoelectronics," said Roy. "Because we have a vast library of superatoms that can self-assemble, these materials offer a modular approach to create complex yet tunable atomically precise structures." The researchers believe that these findings will lead to further investigation into the unique electronic and magnetic properties of superstructured materials. One future application might include a new material that could change from being a thermal conductor to a thermal insulator, opening up the potential for new kinds of thermal switches and transistors. "If we could actively control rotational disorder, we would create a new paradigm for thermal transport," said Malen. For more information, read the article: "Orientational order controls crystalline and amorphous thermal transport in superatomic crystals," Nature Materials (2016). Additional Carnegie Mellon investigators included postdoctoral researcher and alumnus Wee-Liat Ong, Patrick S. M. Dougherty, Alan J. H. McGaughey, and C. Fred Higgs. Ong is jointly advised by Malen and Roy as part of a National Science Foundation MRSEC grant led by Columbia University. Other Columbia University researchers included E. O'Brien and D. Paley. Rotational ordering to induce superconductivity? It's a seductive notion.